Our Cash Cube comes in a vinyl bag. Adult supervision is always recommended on any of our games and inflatable’s. 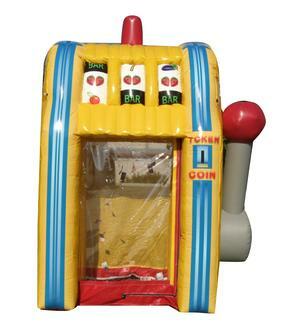 We recommend 1 or 2 adults to load, unload and take down the cash cube. This unit will fit in most SUVs’, mini vans or pick up trucks. Rear seat may need to be removed before loading into your vehicle. Will not load in any cars/car trunk.